The cherry-wood boarded roof sets this building apart from the rest in the area. Located North West of the Castle. After a blood orange varnish, the roof gleams bright when the sun begins to fall over Bloodstain Keep. 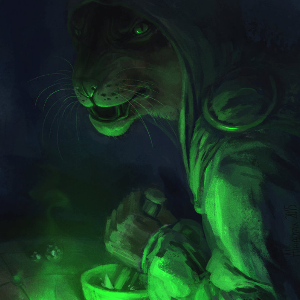 The Alchemist who runs the place is a calico tibbit named Caliban who spends most of his time outside of his building. Whether he is running around town providing aid to bleeding mercs or fetching more supplies to fill his shelves, he is always clocked in. Individuals have suspected that he has created a potion that allows him to go without sleep, but no-one has been able to infiltrate his store. The Path of the Stolen Earth is warded by sinister magic.